Photos provided by Simon Burrow, henger and hengeophile extraordinaire. That’s right–the paper products company is pioneering the tubeless paper roll. 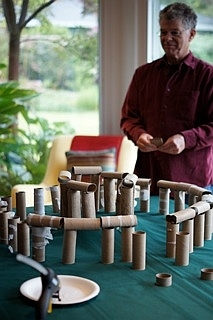 So if you want to build your own bog or toilet paper roll henge, you’d best do it soon! We doubt, however, that you will surpass this thoughtful and detailed construction. Mr. Burrows has been doing henges for a long time and has hit just the right balance between thoughtful and silly. Note the higher inner trilithons and the scattered loose “stones” in what we assume is the direction of the rising sun. We admire the rough look attained by leaving bits of paper that adhered to some of the tubes. There are inaccuracies but we assume the master artist left them in so as not to be too literal. Score? We award it 6½ druids! 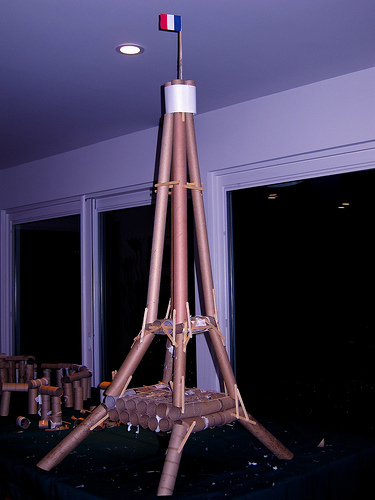 And then there is the matter of the item he has labeled the “Awful Tower.” Hmmm . . . there must be a blog for those, too. How will mankind go on when these versatile materials are no longer available? What will happen to our souls when they are no longer enlivened by creations like this???!!!! But alas! That day hastes toward us like a flock of dead birds hastes toward the pavements of Arkansas. For similar henges, see the slide show on the MySpace page of Captain Henge, the Bog Roll Mania blog, and . . . dang! we can’t remember where we saw the third, so until we remember, how about a nice soap henge? We end with a tribute to Mr. Burrow, who has dedicated himself as few have to the continuation and perfection of the henging art. Thank you, sir, for your contributions to the field. We look forward with great eagerness to your next creation!